Email us to receive a registration form for our 2018 CSA season when sign-ups start in February. We have pickups in Wednesdays in Warrenton, Arlington, Falls Church, and Lorton. Thursday pickups are on the farm. 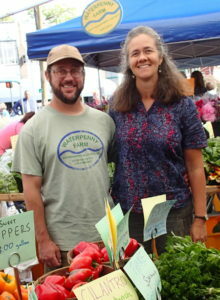 See Farm shares-CSA for more information and to sign up online. Shares offer the best value and a truly seasonal farm eating experience. Deadline for signups is May 31. We have plants for your garden as well as wonderful spinach and lettuce for sale on the farm and at our weekend markets in Arlington (Saturdays) and Takoma Park (Sundays). We also have jars of our delicious homemade soup, as well as fresh herbs. To shop in the farm, come up Waterpenny Lane to the green barn. Pull into the covered area, and find the bulletin board listing items for sale. The glass cooler will be stocked with greens and squash, with prices posted as well. The change box and a locked box for payment are secured to the counter. We operate on an honor system. All are welcome. Here is a link to the short film “Starting with the Soil at Waterpenny Farm” It features Rachel talking about our approach to farming and caring for the soil. It also tells some of our farm’s history and our business philosophy. 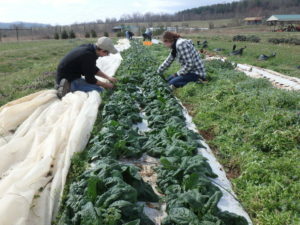 It was made made at Waterpenny Farm in June 2016 by Elinor Goodrich and Aaron Port, through the Natural Resources Conservation Service (NRCS) and the Virginia Cooperative Extension. Our latest batch of red and yellow tomato soups are now ready for sale at market and on the farm. They are a tasty and simple recipe– our tomatoes, basil, and garlic, with Sea salt and organic vinegar. They make a great holiday gift or meal for the cool days ahead. In Spring 2012, we had a bank of 24 solar panels installed on our pole barn. 12 of these panels produce enough electricity for all or our farm use, so now our coolers, greenhouse and barn lighting are all solar powered! This portion was partially funded through a USDA grant. The other half are a personal investment, and produce roughly 1/3 of our home use electricity. We’re excited about this new step in sustainability. In just a year, we’ve saved over 12 tons of Carbon Dioxide from going into our environment, and saved money on our power bills as well. The investment should pay for itself in 10 years.